It's over. Jonas Gustavsson must be stopped. He isn't stopping anything, so the only reasonable course of action is to stop him. I've ignored reality for far too long. Placing any faith in Jonas Gustavsson is a futile exercise. He's not good. I mean he's not good at all. He tricked me once - over a year ago - and for some reason I'm still holding to that distant memory as if it could come back. This despite the fact that his mirage lasted less than a month and everything he has done since then has directly contradicted the notion that he is even marginally capable. Gustavsson showed flashes of brilliance in his rookie season, and strung together a seven-win streak at the end of the season in which he sported a .929 SV% and allowed two or fewer goals in five of those seven games. Unfortunately, if you take an arbitrary streak from any player, during any season, you can probably make them look a lot better than they actually are (Scott Gomez had 10 points in 9 games from December 1st to December 23rd last season). But overall, that stretch masks a terrible season. Gustavsson posted a save percentage barely cracking .900, which only got worse the next season as he ended with a GAA over 3.00 and a save percentage of .890. Last season he registered an above average save percentage in only seven of 23 games, and only one of those came after November 22, a span of 13 starts and one relief appearance. In his nine appearances this season, Gustavsson has played well in only two of them - Oct 27. against New York (.933 SV%) Oct. 29 against Pittsburgh (.919 SV%). He has failed to break the .900 SV% in all other games. Gustavsson is only better than average about one in every three games, and when he isn't above average, he's terrible. As in, I've watched Vesa Toskala and Andrew Raycroft play net, I know terrible when I see it type terrible. The experiment is over. 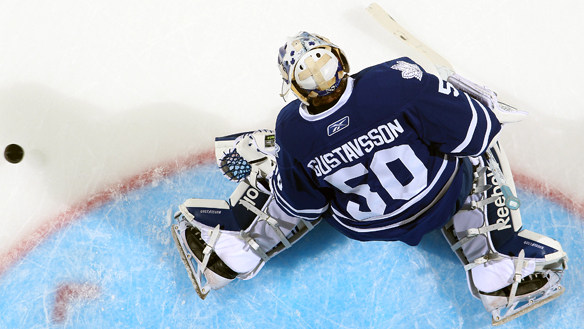 Gustavsson has had two seasons to prove he is capable of playing goal in the National Hockey League and he has failed. Granted, he was thrust into the starter's role way too early when Vesa Toskala proved porous, but he hasn't been able to play well as a backup either and he's making absolutely no progress. The same errors that befell him in his rookie season still plague him today. He over commits, he can't handle the puck, he is easily rattled, and he lets in soft goals with shocking regularity. That's what's most important: he's completely untrustworthy, the worst trait any goalie can have. He can plan well for stretches, but he inevitably gives up a back-breaking, soft goal. It's like clockwork. How do you put your faith in that? And how can you support someone who visibly lashes out after sloppy plays (okay, in fairness, that play is beyond sloppy). It's like the pitcher that gives out death stares or throws their hands in the air when the defence behind them botch routine plays. That type of behaviour is destructive and it's indefensible. Sure, no one likes being shelled night in, night out, but you're playing for the Maple Leafs, that's pretty much expected at this point. Go home and shout all you want, just don't let the other team see it, and don't cut off your defencemen's balls right in front of them. But the most damning argument against Gustavsson is that the team just doesn't seem to play well in front of him. It's as if they subconsciously (or perhaps consciously) want him to fail. I'm a reasonable man. I'm patient and I don't make quick judgments about the Leafs (usually), but I've had enough. Jonas, I'm sorry, but it's time to go. I don't care where you go, but just go. It's not us, it's you. There are a few options for replacing Gustavsson. None of them are ideal, but they're options. Bringing in a veteran who wasn't signed last summer is completely out of the question as that leaves only Marty Turco (.897 SV% last season) and Pascal Leclaire (.908 SV% last season, but so injury prone he just dislocated an elbow hearing us talk about him). The other avenue to acquire a goalie is the trade market. Evgeni Nabokov could be available considering Al Montoya is having a fantastic season and the Islanders are committed to Rick DiPietro until death do them part. Nabokov has a .911 SV%, which is about average, but Hasekian compared to Gustavsson. Or the Leafs could pursue Scott Clemmensen of the Panthers, who hasn't played yet this season, but posted a .911 SV% last year. Prospect Jacob Markstrom has a .944 SV% in five games so far with the Panthers, so he's probably NHL ready now, it just depends whether or not the Panthers plan to use him this season (they currently demoted him to the AHL). Finally, Josh Harding of the Wild is having an excellent season, but is a UFA at season's end and the Wild also have Niklas Backstrom, who is having a stellar season himself, and signed through the end of the 2012-2013 season. Unfortunately, Harding would probably come at a significant cost because of his level of play, the fact that the Wild are doing well with him, and his status at a UFA at season's end. This final point is important because the Leafs should not give up any substantial asset for a short-term fix, this is still a re-building team. Or the Leafs can go crazy and call on Dominik Hasek, it sounds like he's keeping himself in shape. At this point, as stupid as it sounds, I'd have more faith in a 47-year-old than Jonas Gustavsson. And when you find yourself weighing the pros and cons of such a ridiculous idea, you know it's time for a goalie change. Kyle Turris: Doomed to the life of a Desert Dog?